Just look at all of the yummy goodness that comes with this kit! 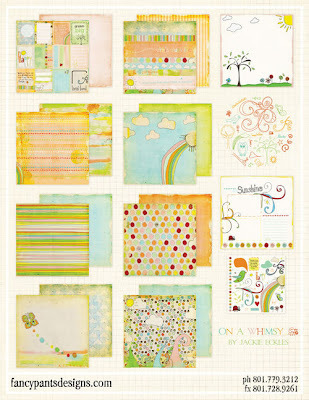 This paper by Scribble Scrabble is just so darn cute. I love the vintage look to it and the wonderful colors. I fell in love with the little cherries! Here's the next "box" mini kit, this time a gable box! I thought it would be perfect to put some brownies in for some new neighbors! So I did a SUPER SIMPLE design for the box and a quick easy card. I promise, anyone can make this! Start by using the box as your template, cut the sizes smaller than the side you are covering, then round the edges (I used a punch for this). 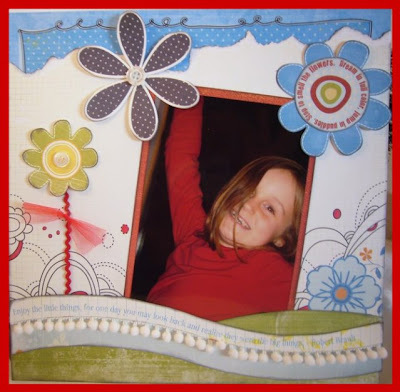 Using my SpellBinder die, I cut a hole for the window, then cut a coordinating frame. I attached the flowers and brads...instant cute! I tied the top with the red tulle, then added a little tag. Last, I made a simple little card. You will be the hit of the neighborhood if you bring these to a new neighbor...or teacher gift...birthday of someone special...just endless possibilities! With my scraps, I made two more cards! You just have a way of making the girls smile. The stunning beauties arrived just in time for a special daddy/daughter dance and made one little darling happy enough to twirl. It always takes me juuuust a tad bit longer to find a home for the Primas. What girl doesn't love flowers- and these don't wilt! 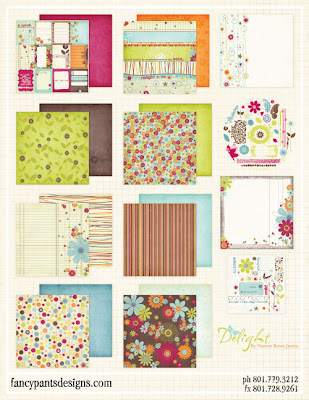 They've also sent some amazing new paper collections and we've made up several new page/layout kits for you filled to the brim with new Prima goodies. 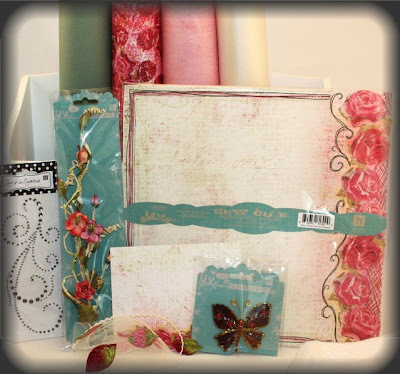 These two kits feature their fabulous new stitched pages. Put away your sewing machine- they've done the work for you! Here's a cute little gift I whipped up for a friend...and I love finding ways to use up my m-a-s-s-i-v-e Prima Flower stash!! I aged the frame using Tim Holtz crackle paint, and attached tons of Prima's that I doused in Glimmer Mist, the added Stickles to the centers. I can't wait to give this to my friend who is having a hard time right now, hope this cheers her up! 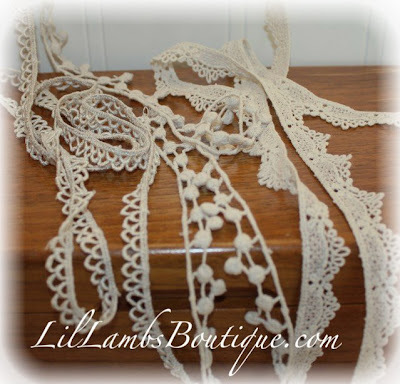 **We just wanted to let our customers and readers know that Tammy is busy, busy, busy working on getting the new website for Lil Lambs Boutique up and running...won't be long now! Keep checking in, it'll be darling! When I've just a minute to create (which seems to happen a LOT around here...that nap time is just not long enough some days!) I make something little that still will bring a smile to my face. Using the stamp from our kit, I made these birthday tags by cutting shapes from my Spellbinder dies, stamping the image, water coloring the image, then spritzing with Pearl Glimmer Mist. Instant adorable! 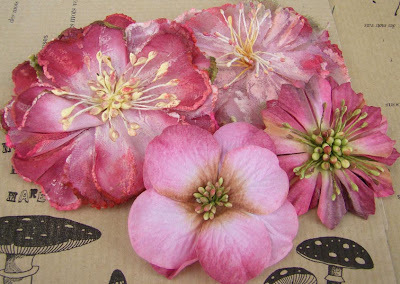 I love to hang these from doorknobs, or car doors, or simply as a gift tag. You get a ton of use from this month's kit! Just a short post today... but wanted to show you another example using Cosmo Cricket's new Snorkel line. This was such a fun layout to do! When I saw the distressed wood patterned paper I immediately thought of this picture and the distressed wood doors used for props. I added some touches of Ranger's distress crackle paint to continue with the theme. I used chalk to enhance the crackle effect on these circles which were cut from the Snorkel patterned paper. On the Fancy Pants Designs chipboard swirl I was able to match the color of the paper by first painting it with an acrylic paint and then going over it again with the crackle paint which allowed the color to bleed through. This paint is so much fun to play with! And a special toot, toot for our designer Catherine Doucette! 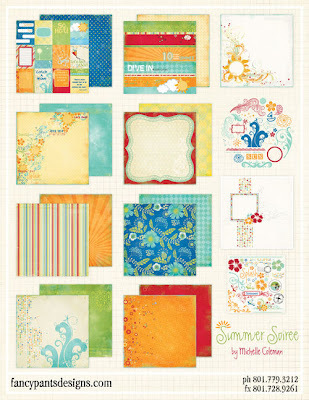 One of her cards using this Cosmo Cricket line was chosen to be published in July's issue of Scrapbook Trends Cards. Congratulations and we are sure we will see many more of your projects published soon! Hope you all have a wonderful President's Day! I'm off to enjoy the kid's day off from school! Do you loooove embossed cardstock? and 7 new colors of their popular Dotted Swiss.... 3 shades of pink, 3 shades of blue and 1 red! 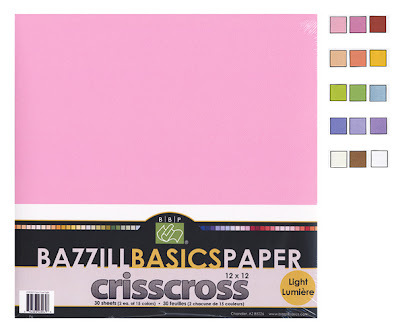 We've also taken advantage of their new Criss Cross Multi-packs they are offering. They come in dark and light packs with each offering 2 sheets of 15 different colors. 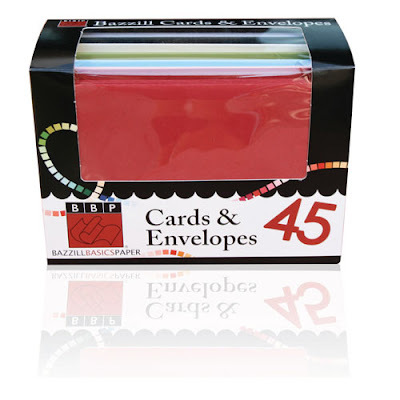 For the cardmakers in the crowd they're making it easy for you... a beautiful assortment of cards and envelopes in sizes A2 & A7 made of premium Bazzill cardstock & in a variety of colors. For our West Tennessee friends, we are thrilled to have been asked to attend the Vineyard Christian Fellowship Mission Crop again. It will be Saturday, April 18th from 8am-midnight. The registration fee includes lots of prizes, 3 delicious meals, access to vendors, and scrapping space. They will also be having a silent auction, so bring the tools that you no longer use or want and let others have a chance to buy them. The registration deadline is March 1st so if you haven't signed up contact Jennifer for all of the details. Hope to see you all there! Cupcakes just make you smile, don't they?? You are instantly transported back to being 6 years old...when the world is perfect when there is a cupcake sitting in front of you! Here's a way that you can bring that smile to someone's face...imagine that smile when they find this little surprise waiting for them?? 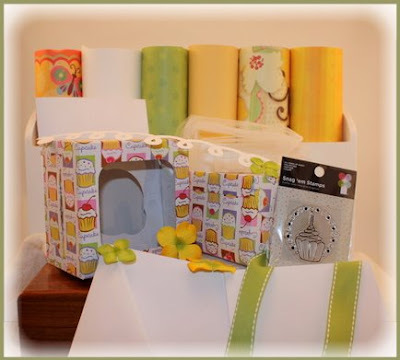 In this kit you get everything you need to personalize two cupcake boxes (with the specially made insert to hold the cupcake in place), two blank cards and envelopes, and the cutest little cupcake stamp. 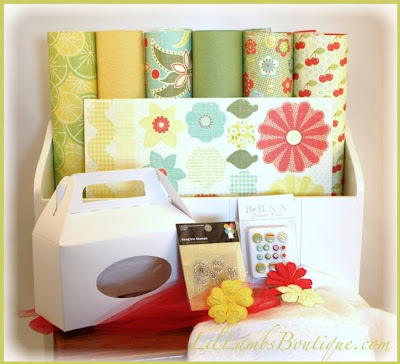 The paper by My Little Shoebox is bright and cheerful, and you will recieve 4 sheets of patterned paper, 2 sheets of Bazzill cardstock, ribbon, tulle, a "frosting" die cut, some Prima hydrangea flowers and a clear cupcake stamp. Unfortunatly, my adorable cupcake prop does not come with this set...but is it not the cutest thing ever?? I loved the butterflies and cut them out to have them "fluttering" all over the box. For the flower on top of the box, I cut out several flowers from the paper, spritzed them with Glimmer Mist and rolled the edges up. When it dried, I attached my cupcake circle (which I cut with my Spellbinder die) to a heavy gauge wire, then held it in place with a button and lots of glue :-). I also spritzed my "frosting" die cut with Bubble Gum pink Glimmer mist and attached it to my envelope. Finally, I embellished the stamped cupcake images with Stickles and Glimmer Mist to make them shine. Ya gotta have some bling! Okay, I know you are going to ask so I'll go ahead and tell you.... that most adorable cupcake was made by Valerie in the IOPG design group. Keep an eye on her auctions- she may be selling these beauties soon! Wouldn't they be the perfect addition to your kit? I can't wait to see what you guys can create with this kit! If you are a paper addict like I am, you know that you sometimes come across a paper that transports you to a particular time or place. When I saw Snorkel...I went straight to the beach! Oh, the colors, the fish, the adorable quotes!! It makes me want those warm beach breezes and children playing on the sand. So, so cute. I created these two cards, and what fun I had while playing with this paper! I pop-dotted the fish for dimension and added Glimmer Mist for some sparkle! Who wants a popsicle?? ...and received another huge package! Just the sound of that big brown truck sends my heart into a flutter. ;-) It's what we've all been waiting for... the new BasicGrey! They have two new lines out now and will be releasing two more in April. 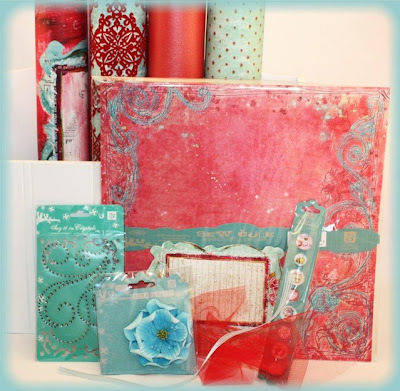 And don't forget about the Page of the Month kits! March and April will be featuring these two new lines with instructions by BasicGrey designers. I do have several people on a pre-order list for these... if you would like to be on that list just shoot me an email. I even have a sneak peek of the next two kits for you today-check it out here! There's great news about our website too- it's undergoing a massive makeover! It will be up and running soon so check back and let us know what you think! Hi all! 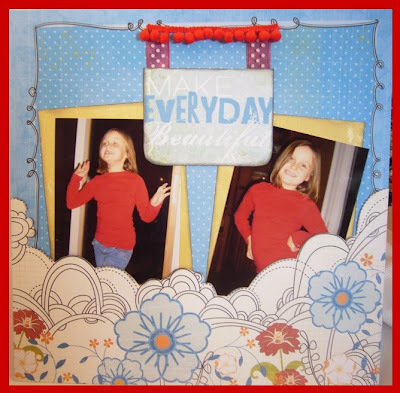 I have a few layouts for you today featuring Fancy Pants Designs! The first two are both made using The Daily Grind kit. This line was perfect for capturing those everyday moments that you hope you never forget. Add some Bazzill tulle and ribbon and a few buttons and you have a few easy and fun pages completed with this kit. 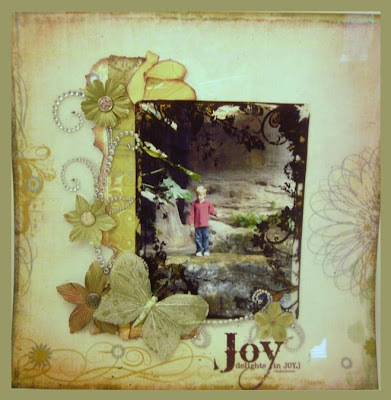 The next layout uses Artic Chill as the background paper with All Fall accent papers and two transparencies. This was from a trip to the Houston butterfly museum so I finally had a reason to use my butterfly I had been hoarding. I spritzed him and some white Prima Flowers with Glimmer Mist and layered them over a Prima Say it in Crystal and the layout was finished in a flash! Ready for some Fancy Pants sneak peeks?? Here are the three lines that will be arriving here any day now. They've outdone themselves again and we can't wait to get our hands on these fun and whimsical designs!